Looking for Valentine's Day treats? You'll find whimsical, "love-from-your-kitchen" treats here! These fun Valentine treats are ideal for sharing at school, the office—or with a special sweetheart, or two! 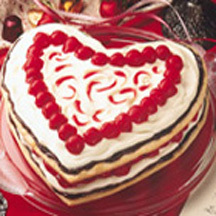 Surprise your sweetheart(s) with this super-easy, 'cheerily' delicious cherry chocolate heart torte. Tip: This dessert can be made to fit the occasion. 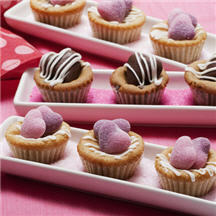 Drizzled with melted white chocolate and topped with candy hearts, these easy cookie cups are the perfect Valentine treat. 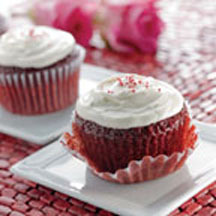 Topped with colorful candy sprinkles, each cupcake features red velvet cake beneath a layer of kissable cream cheese frosting.